FCW holds Open Shop hours primarily for Adult commuters and local residents. During these hours Children under the age of 16 need to be accompanied by an adult. With this rule in mind, we decided to create structured and educational programs just for kids on fridays to even things out. Our Bike Shop Fridays program started this Winter in the form of a 5 week mechanics class in partnership with Columbus State Community College's ESLAC After School Program. 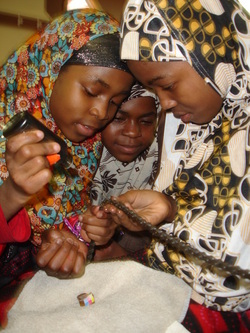 Working primarily with a West Side Somali population, we teach elementary and middle schoolers the ABC's of bike mechanics. (Curriculum for this program will be posted soon!) We plan to run a second 5 week program with the remaining kids enrolled, occupying our Bike Shop Fridays' program through the end of the 2010-2011 school year. During the summer we will hold Open Shop hours for neighborhood kids on Friday Afternoons. 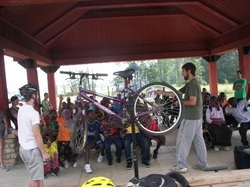 Next Fall we hope to partner with more After School programs to teach Bike Mechanics throughout the city. Please Contact Greg Lanham at Lanhamg@gmail.com about setting up youth mechanics courses.